Use these tips to write your IT project manager resume. Jobs for IT project managers are projected to grow by 12% (or 44,200 jobs) from 2016 through 2026, which is higher than average, according to the Bureau of Labor Statistics (BLS). You'll find the highest level of employment for this job in the following states: California, New York, Texas, Massachusetts, and Illinois; and in the following metropolitan areas: New York City; Washington D.C.; San Jose, CA; Atlanta; and Boston. As an IT project manager, you can expect to earn a median wage of $139,220 per year, or $66.93 per hour, according to the BLS. Additionally, you can search for senior IT project manager jobs and learn more about information technology careers on Monster. 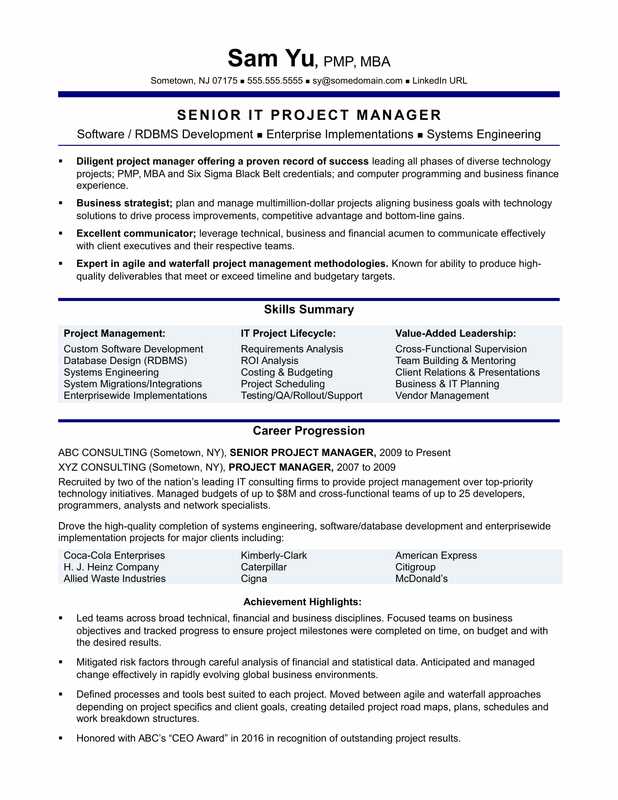 Diligent project manager offering a proven record of success leading all phases of diverse technology projects; PMP, MBA and Six Sigma Black Belt credentials; and computer programming and business finance experience. Expert in agile and waterfall project management methodologies. Known for ability to produce high-quality deliverables that meet or exceed timeline and budgetary targets. Recruited by two of the nation’s leading IT consulting firms to provide project management over large-scale, top-priority and complex technology initiatives. Managed budgets of up to $8M and cross-functional teams of up to 25 developers, programmers, analysts and network specialists. Honored with ABC’s “CEO Award” in 2011 in recognition of outstanding project results. Systems Engineering: Led design and multinational rollout of robust, scalable and secure electronic data interchange (EDI), enterprise resource planning (ERP) and point-of-sale (POS) systems for clients including AmEx, Citigroup and McDonald’s. Results: Completed projects up to two months ahead of schedule, as much as $1.2M under budget and to universal client acclaim. Custom Software Developments: Managed all phases of the software development lifecycle (SDLC) for dozens of custom solutions. Results: Delivered industry-leading software that saved clients millions of dollars, shortened processes from weeks to minutes, captured #1 market share and generated up to $21M in annual revenues within year one of launch. Database Developments: Guided teams in the development of relational database management systems (RDBMS) for clients including Coca-Cola, Caterpillar and Allied Waste Industries. Results: Improved the consistency, recoverability and accessibility of data. System Integrations/Migrations: Project-managed large-scale initiatives involving the transition of programs to new platforms and the merger of disparate systems from acquired client companies. Results: Achieved seamless migrations and integrations that were transparent to client customers, accomplished with no unscheduled downtime and delivered by as much as $750K under budget. Enterprise Implementations: Directed global rollouts of new software and systems for clients including Kimberly-Clark and Cigna. Results: Ensured defect-free releases through careful planning, testing and QA efforts. Completed programming assignments to enhance automated data/voice applications and software within mainframe, network and client/server environments. Improved functioning of databases, communication systems, storage area networks and server configurations. Assessed customer credit risk and established credit limits by analyzing financial information. Conducted collection calls, resolved disputes and maintained accurate credit and collection files. Not that you know the elements of a strong IT project manager resume, you can customize it with your own skills, experience, and honors. But before you submit your resume to job applications, it's best to make sure your candidacy is as strong as possible. Could you use some help testing it out? Get a free resume evaluation today from the experts at Monster's Resume Writing Service. You'll get detailed feedback in two business days, including a review of your resume's appearance and content, and a prediction of a recruiter's first impression. Think of it as QA for your career.